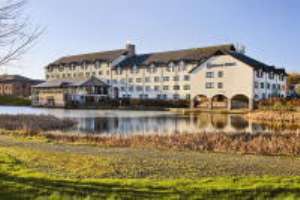 Copthorne Hotel Cardiff - Caerdydd HotelThe Copthorne Hotel Cardiff is centrally located in a tranquil lakeside setting close to the city centre and just 10 minutes from Cardiff Bay – home of the Welsh National Assembly. The hotel is within easy access to the M4 and Cardiff Rail Station, is the closest 4 star hotel to Cardiff International Airport and offers complimentary parking for 225 cars. Four star hotel in a traditional setting, it has a total of 135 guest rooms each with their own en-suite facilities. The hotel also has an abundance of facilities including an onsite leisure club with 15m swimming pool, gym, sauna, steam room, hair and beauty salons. For a fine dining experience visit the award winning Raglans restaurant. The innovative Head Chef looks to local suppliers for the freshest Welsh produce with particular focus on produce in-season. Overlooking the grounds and lake at the Copthorne Cardiff, Raglans offers an elegant yet relaxing setting for any occasion. Alternatively the bar and lounge area provides a relaxed environment for drinks and light meals in an informal setting. Both menus offer a wide variety of dishes catering for all tastes. Additionally this is Wales original home of Dining Theatre. Enjoy one of the fabulous live musical theatre productions accompanied by a delicious three course meal and coffee. The Copthorne Hotel Cardiff is centrally located in a tranquil lakeside setting close to the city centre and just 10 minutes from Cardiff Bay – home of the Welsh National Assembly. The hotel is within easy access to the M4 and Cardiff Rail Station, is the closest 4 star hotel to Cardiff International Airport and offers complimentary parking for 225 cars. Add all these factors together - the central, but peaceful location, comfortable accommodation, four star facilities, and friendly and efficient service - and you have found the ideal venue for any event.